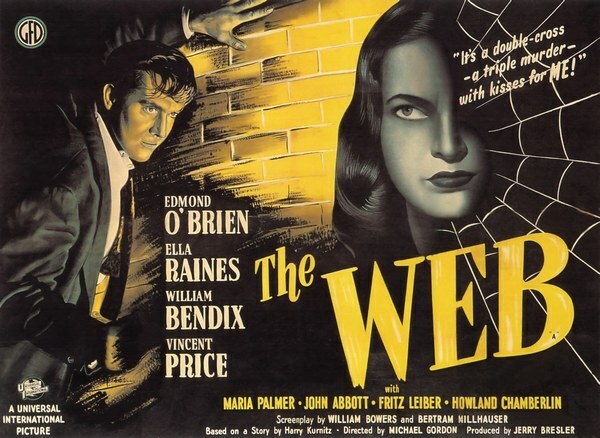 Tonight’s feature is THE WEB starring Edmond O’Brien, Ella Raines, William Bendiz and Vincent Price. At a big city train station, Martha Kroner greets her father Leopold after his release from prison, where he served a five-year term for counterfeiting bonds. Kroner is disappointed that his former associate, wealthy businessman Andrew Colby, has not come to welcome him home. Unknown to Kroner, Colby’s henchman, Charles Murdock, watches him from the shadows. This entry was posted in 1940s, Film Noir Friday and tagged 1947, Edmond O'Brien, Ella Raines, Vincent Price, William Bendix by Deranged. Bookmark the permalink.